# At first prepare the syrup. Pour the sugar and water into a pot and make it boil. # Pour 5 cups water into a bowl add salt in it and mix. Peel the peaches and cut each of them into 2 pieces. # Place the peach pieces into salty water. Rest them in salty water for about 10 minutes. # Remove them from the salty water and transfer into the boiling syrup. Cook them for 2 minutes maximum. Then, place them onto a colander urgently. 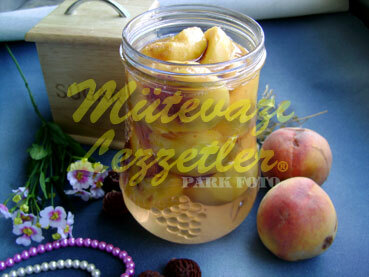 # When the peaches cool down totally, place them into a jar. Pour the cool syrup into the jar also. Close the cap of the jar well. Note: The peach pieces and the syrup in the jar must be cold. Otherwise it may spoil easily.